KENSINGTON – Boro Park’s booming Orthodox Jewish community is spilling over the borders of the neighborhood, bringing with it new religious schools and new tensions with neighbors at the sleepy end of Kensington. The big new school that opened on the corner of Clara Street and 36th Street last fall has been a case study in how little local officials are doing to manage the boom, or to soothe growing tensions at the rough edges of the neighborhood. 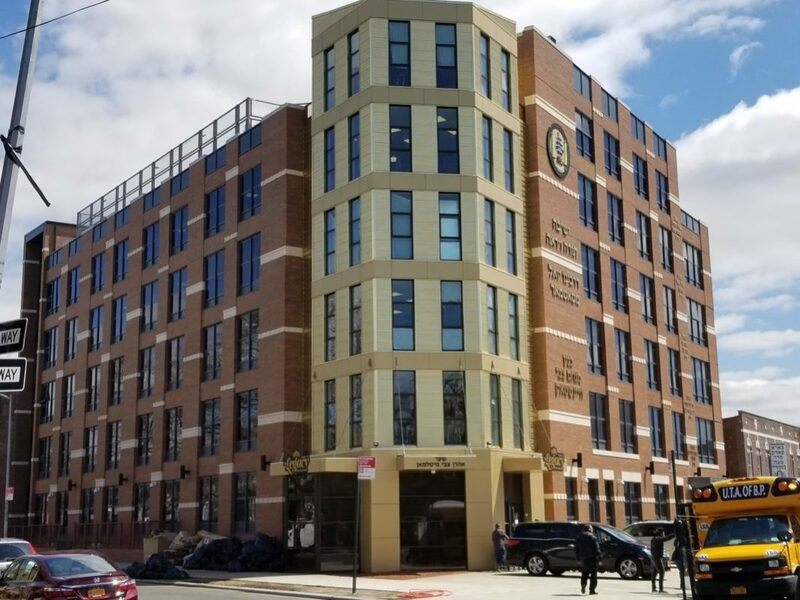 The school, the United Talmudical Academy of Boro Park holds a special variance from the Board of Standards and Appeals to build a high school for about 1,000 students, and the builders promised that most of the students would walk to school. But neighbors complain that the school is educating an unknown number of elementary and middle school kids, who arrive on 14 buses. The narrow one-way streets are clogged with waiting buses six days a week. The building also houses an event space, hosting events nightly. Weddings spill into the streets, with tables set on the sidewalks, increasing the amount of garbage, noise, and congestion in what until recently was a quiet residential neighborhood. It’s happening with almost no government oversight, causing new tensions on the border of the booming Boro Park and quiet Kensington. Community Board 12, in particular, has avoided dealing with the tensions. At a heated meeting in May, the board’s chairman, Yidel Perlstein, said the school was within its legal rights. In the spring, the city’s Department of Environmental Protection issued violations for the noise generated by the heating equipment that kept scores of neighbors awake at night last winter. It seems nothing’s changed since, and with the cold weather, the complaints will start coming again. Assemblyman Robert Carroll has been the only elected official to try to help mediate the situation between the Orthodox community and their non-Orthodox neighbors, though with no success. The May meeting, which over 50 local residents attended, was supposed to produce a better dismissal schedule, improved garbage storage, and better communications, but neighbors say nothing has changed. At the October CB12 meeting, Assemblyman Carroll requested another meeting with the school to discuss these issues. 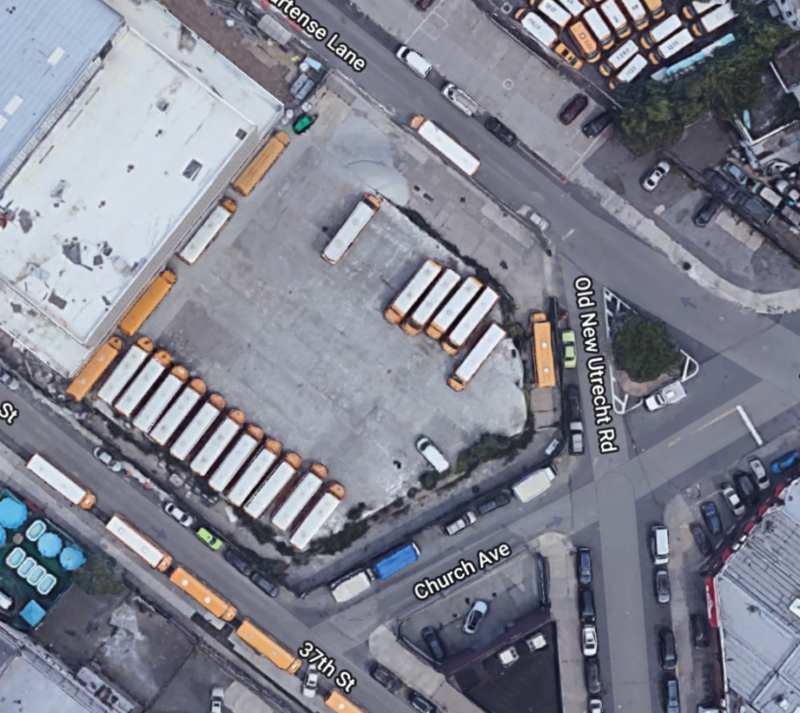 Location of the new 9-story school to be built, currently school bus parking lot. And with tensions rising, there’s more construction on the way. In the spring, Community Board 12 approved granting a variance for a new, nine-story building for Bobover Yeshiva Bnei Zion, which councilmember Kalman Yeger estimates will serve at least 1,000 students. The project is making its way through the city’s Board of Standards and Appeals now, and would be located at the corner of 36th Street and Old New Utrecht Road, a block and a half from the Clara Street school, adding to the cluster of three other schools within two blocks are educating at least 1,500 children. The Kensington side says they’ll keep fighting. “We are a united and diverse community determined to have our voices heard,” Conroyl wrote. You do remember the sanitation pick-ups in Boro Park were rescheduled for the nighttime because of the school buses. Don’t you?